Are you looking for a work-at-home phone job that is NOT sales? Do you enjoy helping people, especially patients? Then Pleio may have something for you. Originally reviewed in 2013, Pleio has been through many changes as most work-at-home companies have been through. Pleio (pronounced “Play-O”) is a company based out of Canada that has incorporated into the US. In 2013 it became known as Calladay on the US side. This was to distinguish the call center in Arizona from the original headquarters in Canada. A Pleio GoodStart Agent as was the original name is a person who provides a complimentary follow-up service for people on important medications. 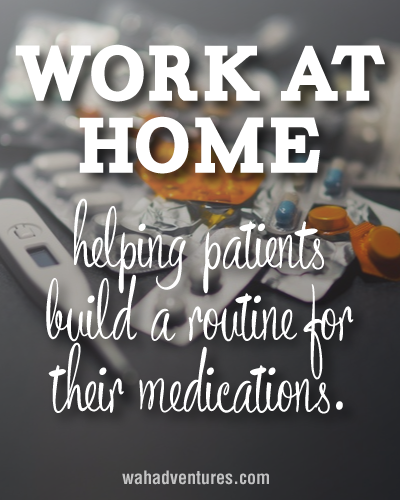 This service is a way to help patients build a good routine for their medication and overall health. Originally, there were two types of calls: registration and customer service. Now, the customer service agents also do the registration calls. All calls are outbound and come into your hardwired phone via their own calling system, Tandem. What Do GoodStart Agents Do at Pleio? Most—not all—patients will sign up for the GoodStart Program at their local pharmacy. However, most of the patients don’t know much about the program, which is where the GoodStart agents come into the picture. As a GoodStart agent you will be officially following up the patients and registering them. Then depending upon the drug program, you will be following up with a series of two to four calls all roughly one to two weeks apart. These calls are from a script, which you will be reading and going over with the patient. Most of these are well-known medications that you have seen on television commercials for diabetes, hypertension, depression, and also high cholesterol. These are not generic drugs, but the ones made by big name pharmaceuticals such as Merck or Novartis. While you won’t be giving medical advice or answering medical-type questions, you will be reading a script and reviewing the routine and side effects of the drug. You will also reporting any AE or Adverse Events the patient is having with the drug. Adverse Events are symptoms directly related to the known side effects of the drug. Pleio has a very specific way it needs to have Adverse Events reported. Many GoodStart agents start out on one drug program and then as they learn and become more fluent in the process, are then invited to train for other programs. It is not uncommon for agents to have eight or more drug programs that they call on. Is This An Independent Contractor or Employee Position? This is an independent contractor position and not an employee position. There are no required or expected hours a GoodStart Mentor must work. Pleio GoodStart Mentors sign a one year contract after 30 days of successful on-boarding. They are currently in a growth stage and will be accepting applications and bringing Mentors on-board continuously year round. What Are the Eligibility Requirements to Work at Pleio? What Are the Technical Requirements to Work at Pleio? From time to time, you may also be asked to run your computer through the Belarc Advisor or another system and take a screen shot of the results to prove that your computer system is up to date. What is Training Like at Pleio? Training as a Pleio GoodStart Mentor is done through a self paced learning management system which provides “hands on” application. Training class consists of one or two days of role play for 2.5 max each day. The expectation would be for the Mentor to be on the schedule taking live calls after the second day of role play. There is a background check fee for all agents after they have completed training. The background fee is $45. What is the Pay Like at Pleio? Pay is still once a month through direct deposit. The direct deposit usually is delivered sometime between the 15th and 24th of every month. The average GoodStart Mentor makes $16 an hour. Those who consistently work 30 hours, evenings and Saturdays average more like $18-20 an hour. What Are the Hours Like at Pleio? Pleio’s calling hours are 8am-midnight EST M-Saturday. What Do Others Think of Pleio? Like all work-at-home companies, opinions vary and vary greatly. You can read the latest reviews at Glassdoor for yourself. Pleio received a 2.8 out of 5 star review. How Can An Interested Individual Apply to Pleio? There is an actual process to go through when you apply. There is Step 1 and Step 2. Fill out the online application and attach a resume. Pass the technology assessment with a score of 85% or above. Record one mock call (script reading) via calling the 800 number given. Pass the Pleio Privacy test with a score of 90% or higher after 2 attempts (must pass the above steps first). Pass the phone interview and questions asked. Electronically sign the new hire package which includes a W-9 Form, direct deposit form, background release form, and other confidential forms. You must apply for an EIN number, because you are not allowed to use your social security number any longer. Applying for an EIN is free. Pass the online practicum with a score of 90% or higher and any other onboarding requirements. Pass the Adverse Events required test with a score of 90% or higher. You can go to their website and click on the apply button to begin the process. Or you can also watch when they post openings at sites like WorkPlaceLikeHome and Rat Race Rebellion. I read on Glassdoor that the company pays per call. I thought is was an hourly wage. Can you please clarify which is accurate.